NASA developed Light Emitting Diode (LED) technology is used in doctors’ offices to address mild to moderate inflammatory Acne and blemishes. 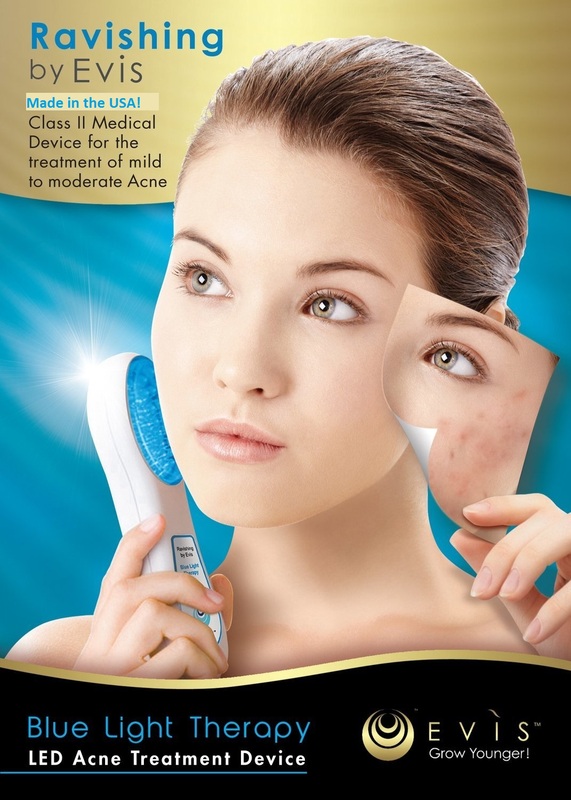 Acne Vulgaris is a common condition affecting 80% of the population. A blemish is formed by sticky skin cells forming a plug trapping oil, bacteria and debris inside your pore. Bacteria feed of the skin plug and produce pro- inflammatory chemicals. Your pore becomes infected and inflamed. As your skin continues to produce oil, the pore swells. Your pore becomes infected and the plug and bacteria flourish. The LED blue light targets and destroys the bacteria without side effects or scarring, revealing a clearer, more radiant and even-toned complexion. EVIS MD PLATINUM BLUE emits the appropriate wavelength at optimal power intensity to address mild to moderate inflammatory Acne as well as occasional breakouts. Unlike most topical treatments, EVIS MD PLATINUM BLUE delivers medical grade performance with no irritation or side effects. With consistent use, you will begin to see a clearer, flawless, more radiant complexion. Long term benefits are cumulative over time. EVIS MD PLATINUM BLUE treatments are completely safe, easy and effective with no side effects. EVIS MD PLATINUME BLUE is non-thermal, non-ablative, non-invasive and requires no down time. Treatments are both corrective and preventative. 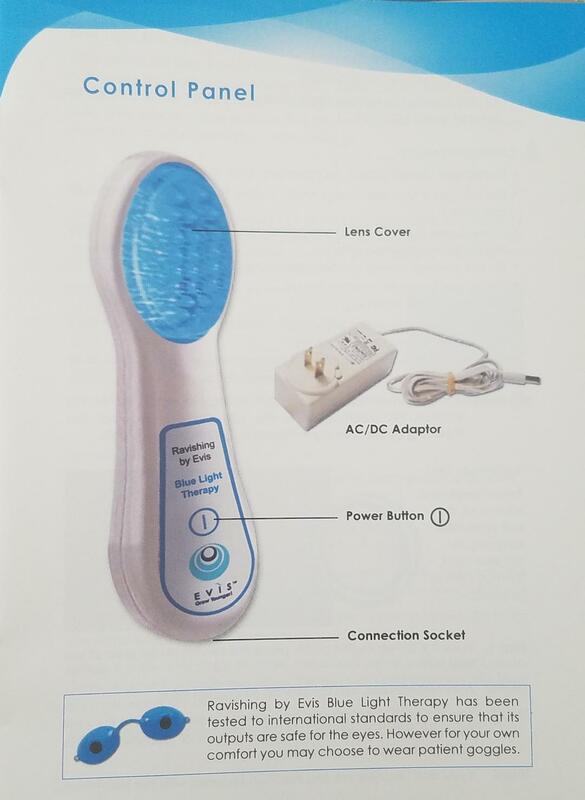 "The Blue Light of the EVIS MD Platinum effectively targets and kills bacteria that cause acne without any side effects such as redness, dryness and irritation." 1. Remove the protective ring from the device by pulling it straight off. 2. Connect the AC adaptor to the bottom of the device and plug the cord into an electrical outlet. Press the power button on the device. 3. Gently place the panel directly on the skin over the target area to be treated. 4. Hold light in place for a minimum of 3 minutes per area. 5. Repeat steps 3 and 4 for each area of concern until all areas have been treated. 6. You may follow treatment with an appropriate hydrator and sunscreen. 7. Wipe the light panel with alcohol after each use. Begin your treatment on clean, dry skin. The device will beep every 3 minutes to help time the treatment. It automatically shuts off after 18 minutes and may immediately be switched back on to continue treatment if desired. We recommend a minimum of 9 to 18 minutes per area per week. You may safely increase treatments to as often as desired. To achieve the full potential and cumulative effect, after the initial 8 week period, it is recommended that you continue treatments as desired, covering all areas of concern.